When it comes to owning a hot tub, the last thing you want to do is stress about maintenance. After all, you purchased a hot tub so that you could relax. Ensure your future years of hot tub ownership are both relaxing and carefree by looking for these three key essentials while shopping for a hot tub. 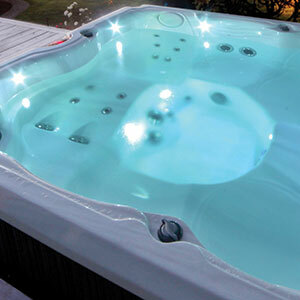 Knight Tubs Pools & Spas provides full-service care and repair for all Jacuzzi tubs in the Okemo & Stratton regions. We also take care of repairs and provide chemicals and supplies for your regular maintenance at our convenient Ludlow location. 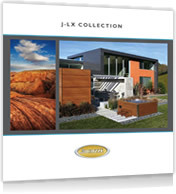 Ask about the size of the hot tub’s filter and how it stacks up to others on the market. Make sure filters are easy to access, remove and clean. Keep in mind that filters with large surface areas collect more debris and reduce the number of particles pumped back into the water. Two-stage filters are extremely effective at cleaning the water, as the first stage traps the large debris that makes the water cloudy and the second stage removes any remaining smaller particles. 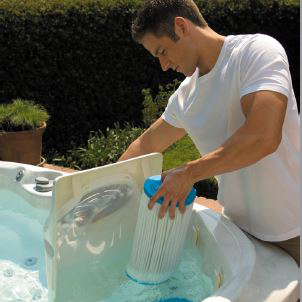 Make sure the hot tub comes with a skimmer, which removes particles like leaves from the surface of the water. Look for a skimmer with a floating design that draws in floating debris quickly, preventing scum from forming around your spa’s waterline. Top-of-the-line skimmers have a skimming area of up to 32” and are connected to the 24-hour filter pump, which means they’re constantly skimming the surface and trapping debris. as eye and skin irritation. With the one-two punch of the filtration system and water purification system doing the majority of the work, your job is easy! All that’s left to do is simply check and maintain balanced water levels after each use and hose out the filters, a process which takes no more than 10 minutes per week. Armed with some basic supplies (test strips, a chlorine or bromine sanitizer and a garden hose), follow these simple steps. After each use (2-3 min): Check the water’s balance by dipping in a test strip for 1 second, and then waiting 15 seconds to ensure an accurate reading. If the test strip indicates a low sanitizer level, add roughly a cap full of your preferred sanitizer (check the recommended dosage based on spa size and usage). Weekly (2-3 min): Once a week, oxidize the water. 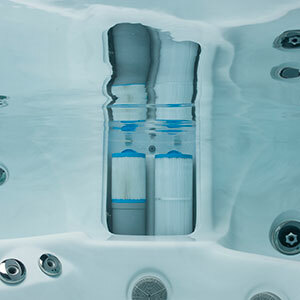 Also known as “shocking” the hot tub, this simple process involves adding an ample dose of sanitizer/oxidizer to quickly destroy any unwanted contaminants that can cause cloudy water or odor. Monthly (10 min): Once a month, remove and clean out your filters with a high-pressure hose. It’s best to have a secondary filter on hand to switch out during the cleaning process. See all the new features the Jacuzzi has to offer. When shopping for a hot tub, be sure to consider the warranty. Other brands guarantee’s last 1 or 2 years, but our quality hot tubs feature limited warranties for up to 10 years! In addition, Jacuzzi’s network of authorized dealers and technicians is standing by to ensure years of worry-free enjoyment. © 2018-2020 Knight Tubs Pools & Spas. All Rights Reserved. Site designed & maintained by Green Mountain Marketing & Advertising, Inc.